Roger Raglin 16oz Weapons Cleaner & 2oz Weapons Lubricant Set the shooters choice! Nfused Weapons Lubricant NFUSED is a synthetic dry metal conditioner which molecularly bonds to heated gun metal making it self-lubricating under the toughest environmental conditions. Unlike traditional gun oils, NFUSED protects the metal surface by a super tough regenerating hi density electro-chemical bonding process. NFUSED is not a temporary coating. It seals and conditions the heated metal leaving a "dry" lubricated surface that reduces heat, improves performance and prevents jamming, and corrosion. Ease of cleaning is an added bonus! 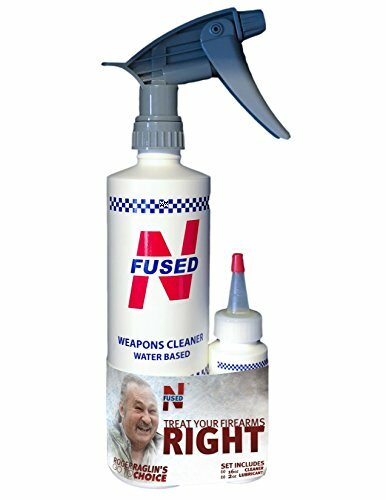 Nfused Weapons Cleaner is A highly effective gun cleaner safe for use around varnishes, wood gunstocks, camou flage, finishes, polymer stocks and frames. contains corrosion inhibitors to prevent ash rusting of freshly-cleaned firearms. Contains NO ammonia. After cleaning, use NFUSED Lubricant for the ultimate lubrication and protection. If you have any questions about this product by Nfused, contact us by completing and submitting the form below. If you are looking for a specif part number, please include it with your message.